Kitchens are essentially the beating heart of the home. Not only do they provide a space to prepare and cook food, but they are also a central meeting point for family members and friends. 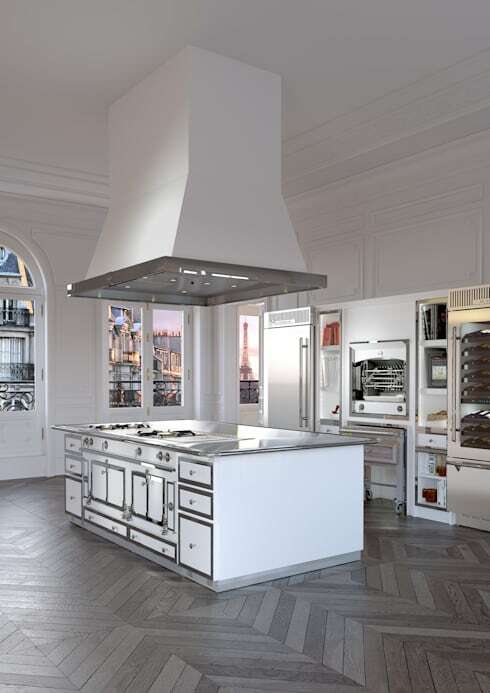 Because the kitchen is so important to the practicality of a functioning abode, it is imperative the space is designed in a stylish yet versatile manner. As your cooking space is such a popular domestic gathering area, it also tends to become untidy rather quickly. With so many individuals moving in and out of the kitchen so regularly, mess and clutter tends to ensue. So how does one plan a kitchen to avoid the inevitable chaos and mess? Today on homify we are going to be taking a look at open plan kitchens that have been designed to minimise clutter and emphasise spacious versatility. Open plan living is about maximising the free-flowing interior spaces, and avoid tight nooks or awkward recesses. For some sophisticated examples, gorgeous kitchens, and a few great ideas, take a gander at the striking images below. First things first you are going to want to plan your space. As this can be one of the hardest and most challenging aspects of your kitchen undertaking, it is often recommended that you chat to a professional interior or kitchen designer. Creating open plan spaces have become particularly popular in the last few decades, and this has in turn seen the rise of many new designs and interesting kitchen styles. 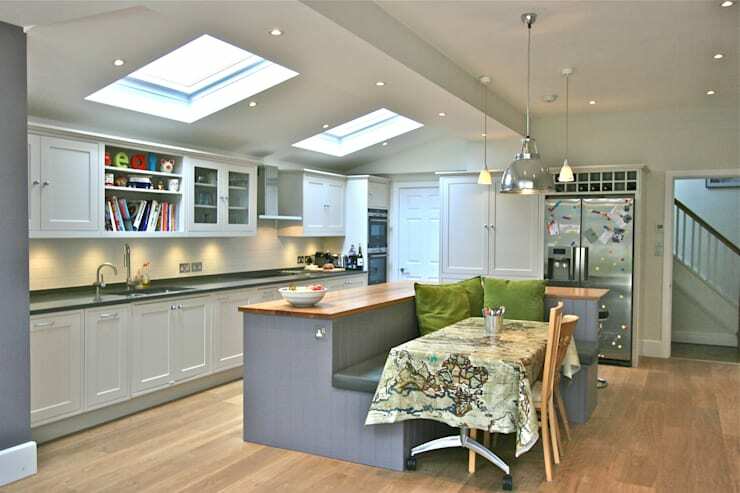 Open plan spaces are a highly desirable home improvement, but they can be difficult to plan. As there are fewer walls, and a larger area to work with, uncertainty can easily arise due to the abundance of options and possibilities. One helpful tip is to imagine that the walls are in place. This ensures your design retains its flow and sense of continuity. It will additionally assist with the placement of certain items. Furthermore, you need to ensure proper circulation within the room, while allowing for space to open doors, and cupboards etc. One good way to ensure you correctly plan your space is to produce a scale drawing and cut out pieces of paper to represent the furniture, hardware, joinery and more. This way you will get a bird's eye view of the room, and can move items around to find the best configuration. Window position is another important consideration. You may want your new kitchen looking out over the garden, or you may want a sink located within the kitchen island, looking out into the domestic spaces. This unique design incorporates a casual dining booth into its island to maximise space. Colour scheme is next on the list of important items to consider when planning your new open plan kitchen. Consistency in the decoration of your kitchen will help it integrate with the other adjoining rooms. The most obvious choice is a neutral palette of muted hues and shades. This offers an easy backdrop to work with, and ensures the room is light, bright, and airy. 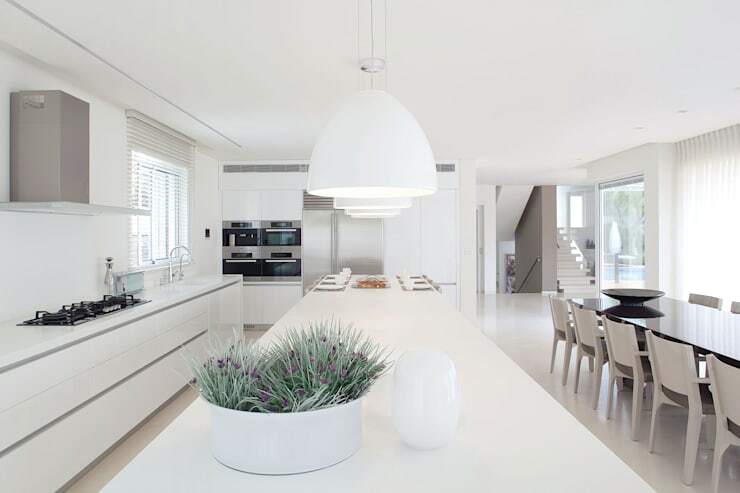 This example is a fabulous illustration of an open plan kitchen that utilises bright white tones, and a monochromatic aesthetic to allow the room to feel large and clutter-free. Consistency is one of the most important factors when choosing colour, as each adjoining space must be able to function independently, without ruining the overall cohesiveness of the design. When we think about a clutter-free kitchen, we don't necessarily involve flooring as a contributing factor. 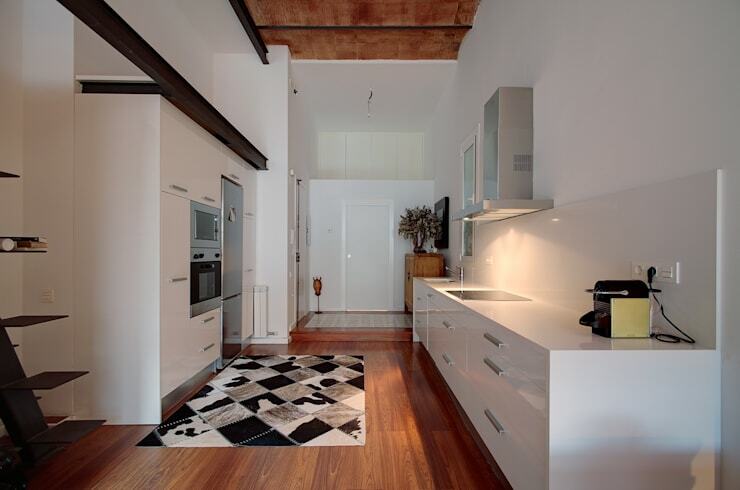 Surprisingly however, flooring can make a huge difference to both an open plan space, and also a clutter free kitchen. Similar to choosing your colour scheme, you will also want to ensure you pick flooring that is going to create consistency throughout your home. Flooring needs to be hard-wearing, long-lasting, and also look great. You don't want a gorgeous timber floor if it is going to collect dust, dirt, and eventually contribute to the space feeling cluttered and chaotic. Instead pick a floor that can be easily cleaned, requires little maintenance, and would suit other areas of the open plan space such as the dining or living room. A further consideration is the noise associated with some floors. If your open plan space is exceptionally large, you will want to avoid floors that echo and reverberate sound easily. Check out our other Ideabook The handy guide to kitchen flooring for some extra tips and tricks! Next up we are going to look at lighting. Lighting may not seem as important for an open plan kitchen, nor does it immediately appear crucial to a clutter-free space, but surprisingly, your choice of lighting will drastically impact the end result of your design. Light fittings are more than simply a way to illuminate an interior area. Lights can segment different spaces, essential to delineate zones within a large open plan room. This example is a fabulous illustration of how lighting improves an interior area. The large suspended pendant lights hang delicately over the island, and demarcate the kitchen from the dining room. This kitchen is clutter-free too, employing only necessary accessories, and ensuring the space feels light, accessible, and contemporary. In order to ensure your kitchen is clutter-free, you will want to maximise your storage space. Storage of everyday items can be easily accessible within cupboards and shelves, while still appearing organised and neat. 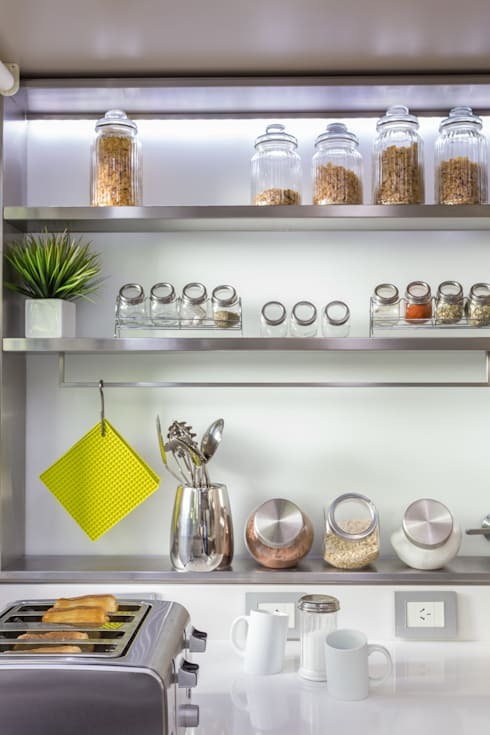 One of the biggest problems with kitchens becoming areas of clutter is the way individuals tend to use their storage as a place to keep bits and pieces, which are often unneeded and unnecessary. Typically the kitchen is the main place where this occurs, so it is extremely important to de-clutter and clean out. The first step to de-cluttering is to remove anything that you do not use. Kitchens are full of utensils, gadgets, and things that were once needed, by cleaning out the majority of unused accessories, you will drastically refresh your space. Secondly, you should relocate anything that doesn't belong in the kitchen. As the kitchen is essentially a natural gathering place for the family, it inevitably gathers household miscellany that it doesn't own. Things such as mail, children's homework, keys, and tools can all be given a new home, and in turn this will significantly de-clutter your kitchen. Once you have removed anything that isn't needed, you can utilise your storage to its full capacity! Last, but certainly not least we are chatting about the need to only hold onto the necessities within your kitchen. An open plan kitchen has many benefits, and one of these is its easy accessibility to the rest of the home. Because of this, open shelving can look fabulously welcoming, and help to create a stylish and unique appearance within your abode. One important factor to consider when refreshing, planning, or starting your new open plan clutter-free kitchen is to only keep the absolute necessities. We accumulate food products and accessories over time, so it is extremely important to spring clean your space, your pantry, and your cupboards. This example shows a well organise open shelf system that would look brilliant in many different interior themes. Each jar is neat and tidy, avoiding unnecessary accoutrements or accessories. It is practical, stylish, and ultra-versatile. 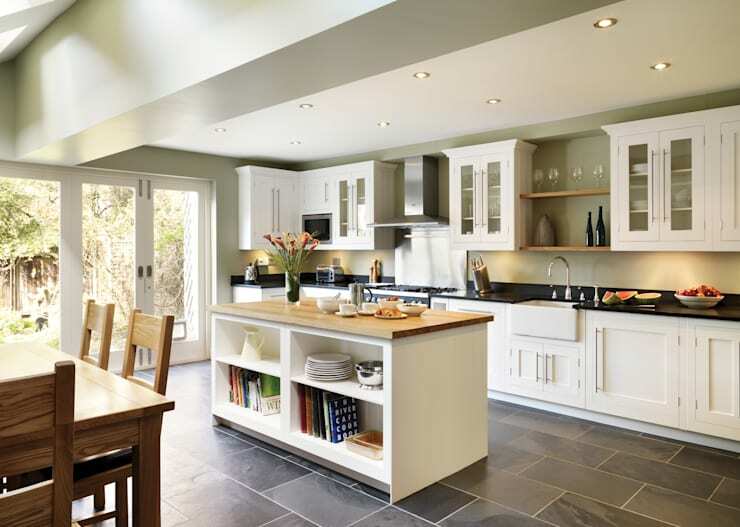 What do you love (or perhaps dislike...) about open plan kitchens? Chat to us in the comments below!